In Europe, SEOs are wracking their brains over what Google is up to in the UK. The Twitterverse has been buzzing over the last three months about Google’s strange search results, and many bloggers have addressed the problem since early June. What’s happening? Last June several UK SEOs started to notice changes in the UK SERPS. At first it seemed as if the Vince Update, which hit the US last February, caused the change in rankings. But in the UK there seemed to be more than just Vince affecting results. The Vince update, for a short period, caused a change in rankings for brand-related searches. In the last couple of months, however, it was not just big brands that dominated search results—.com sites were taking over the results in the UK, gaining prominence over .co.uk sites based in Great Britain. Something like this happened before in 2008, when UK searches were mixed with US searches. But this time it was different. Not just American results started popping up. Australian, South African and even Dutch results started ‘beating’ the local UK results. Some results were pretty surprising. Where you would expect UK results for local searches now (in many cases irrelevant) US-results appeared. Kevin Gibbons of SEOptimise, also a Search Engine Land writer, was one of the people who noticed the US results first. After that more and more started to notice bizarre search results. Let’s first look at some examples. Remember the searches are at Google.co.uk, so you can presume its a UK resident who is performing the searches. Keep that in mind while looking at the examples. In this example the UK Maps started showing results for Hull Place in St. Louis Missouri while searching for a driving school in Hull, which is also a town in the UK. When looking for a family home in Kent, two different Kents, both in the US, show up. 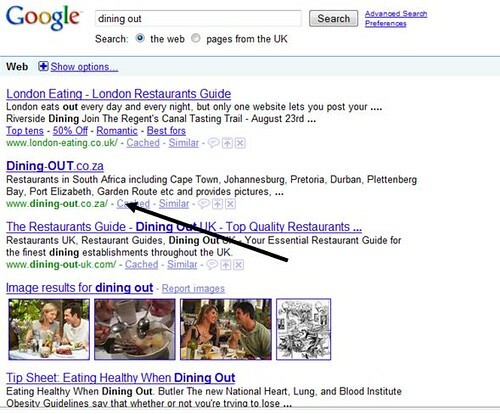 When searching for “dining out,” does Google really expect English residents to go and dine in South Africa? Matt Cutts replied to these issues by explaining in his video that “there was nothing wrong.” He stated that Google is making changes to the SERPS so that the results will be more relevant. If .com results are better than UK results, they should appear higher in the results than the co.uk results. Cutts is right on that point, of course, weren’t it for the fact that the results are in many cases not more relevant—in fact, many are less relevant. Yes, some examples illustrated Cutts’ points, but not all of them. So what is going on here? There were many theories going around in Europe, one more serious than the other. Let’s take a look at a few. The most interesting one was the conspiracy-theory of Freshegg, which suggested that “a conversion took place at some point between the US government and Google to alter the search results in favor of US sites, thus increasing traffic and also sales for the US.” This theory is of course ridiculous but is being fed by the fact that for a long time Google didn’t react to any questions regarding the subject. The Vince update came by around the same time as the Google results got mixed up. The brands are favored more and that would cause US results to be favored above others. It could have been something really simple. Maybe the data centers in the UK had bad data mixed up with the latest algorithm update. That would explain the confusion. However, if that was the case, wouldn’t Google have fixed the problem by now? Google is up to something… but what? You can’t discount the possibility that Google might really be up to something, and just isn’t revealing its plans. Something big, maybe? Is Google changing the way they handle local search? Are they playing around with language-issues? Is Google getting rid of the UK SERPS all together? Matt Cutts’ answer seemed to point a little to the last theory. Google is changing the way it looks at local SERPS, saying it wants more relevancy to the results. Therefore a .com result which is more relevant to the search than a UK result should come on top. Not really. When Cutts posted the video several UK search marketers responded and “were giving me a bit of a hard time” said Cutts on his blog. With that he meant the responses of UK marketers who either didn’t believe his words or felt they were being fooled. Why? Because the search results are to say the least still a bit strange. A quick look through the comments on Matt Cutts’ post gives a more examples of results which are, to say the least, strange. When searching for “southbank restaurants” on Google.co.uk you would expect restaurants from the South bank in London instead of a Melbourne Australia result at the number two spot. A Google Map for when searching without the quote marks to get an exact phrase match even shows six Australian, two .com and only 1 .co.uk result. Another one which is pretty funny actually is the search for ‘motor forum‘ where the very first result is a Dutch web forum. Why would UK searchers want to visit a site written in a language they can’t even read? In the comments of Cutts’ post there are more bizarre examples. So is it a case of UK marketers feeling they might be losing ground and gaining competition and therefore complaining? It looks not. The explanation Matt Cutts gave is a valid one, but then the results should really be more relevant, and the examples show they aren’t. So this curious case doesn’t seem to be closed yet. I am a Web/search strategist, international search specialist, trainer, and well-respected blogger. I am well informed about what’s going on in the world of Internet and search marketing worldwide and especially Europe.I am the owner of Stateofsearch.com, a website on which myself and some other bloggers try to look at the next step in search. I am also the owner of NetTraject, a Dutch company that advises on international search matters and provides training in search engine marketing and project management. I am also founder of Searchcowboys.com.I am a regular speaker on different marketing and search events. Finally I am the host of several podcasts, including a weekly show on a WebmasterRadio.FM.